The BBC was last night accused of ‘outrageous scaremongering’ about the impact of public spending cuts after commissioning a documentary in which a street has all its council services taken away. Those living in the suburban cul-de-sac have their bin collections stopped, street lights switched off, and are left to clean up dog mess. At licence fee-payers’ expense, they are even set challenges by film-makers, including dealing with smashed-up cars being dumped outside their homes, old sofas left in the road and graffiti sprayed on their garden walls. 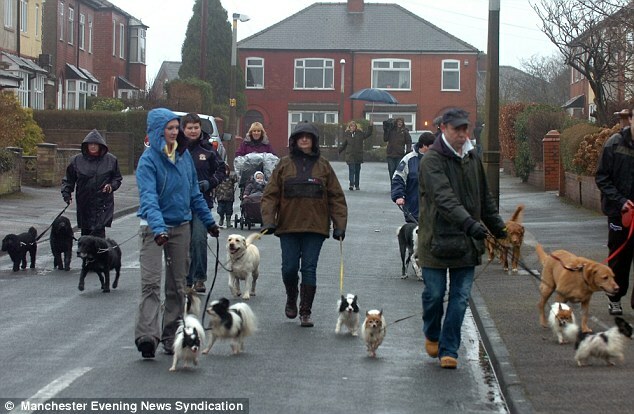 In one bizarre scene, producers hired a dozen dog owners and marched them up and down the street – apparently encouraging their pets to foul the pavement. But last night the corporation – already accused of bias in its coverage of the public sector spending cuts – was engulfed in a major political row. An aide to Communities Secretary Eric Pickles reported the BBC to Ofcom, branding the film ‘an unforgivable breach of editorial standards’. ‘This is an outrageous piece of scaremongering by the BBC and compromises their editorial integrity,’ said Conservative MP Stephen Hammond, parliamentary private secretary to Mr Pickles. Details of the series – which will cost around £1million to make – emerged after the Daily Mail has highlighted instances of the BBC’s biased reporting of the battle to save the UK’s economy. Last year director-general Mark Thompson made an unexpected appearance at No 10 clutching a memo promising the BBC would put its coverage of public spending cuts into ‘context’. The 21 families living in the cul-de-sac in Preston, Lancashire, have all agreed to take part in the programme, called The Street That Cut Everything and presented by BBC Political Editor Nick Robinson. Film-makers are spending six weeks focusing on the cul-de-sac – renamed simply The Street for the programme – to examine how residents cope without so many basic services. The local council has agreed to switch off street lights and has taken away wheelie bins, and residents have been given a rebate on their council tax which they have pooled together to pay for alternative solutions. In addition, producers have set up unexpected ‘challenges’, such as dumping smashed-up cars in the streets, fly-tipping sofas and fridges and spraying graffiti on walls. One resident, Tony Wilding, a retired aerospace worker, said: ‘It’s been hard work dealing with the challenges they’ve set us, but it’s definitely been rewarding so far. The 59-year-old widower added: ‘The dog mess was a step too far, though – they had a dozen dogs parading up and down, doing their business, which wasn’t pleasant. County Council are co-operating with the programme, but the film-makers – and ultimately the BBC’s licence fee-payers – are footing the bill. Residents are not meant to access local libraries or leisure centres, but their children are attending school as normal and emergency services are unaffected. What I’d like to see is the BBC making a documentary on what people would do without the BBC. I think the conclusion will be people being £145.50 a year better off because we have plenty of other television channels to watch for FREE. Obviously the BBC would make most stuff up to support them.